I hope you were able to grab the remote first today, and are ready to watch more BoJack Horseman. On this week's show, Jill and I talked about our fun happenings - woooo! Pat and Jill recap their weekend adventures at Keystone Comic Con (2:26) and another successful bag bingo (39:34)! Sorry these show notes will be a bit scarce, but I don't know how to add images next to each other. 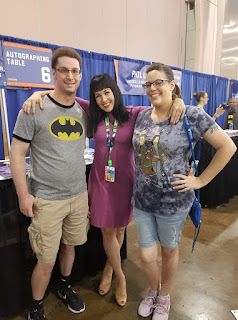 So for the moment, here is a photo of us with the wonderful Grey DeLisle! That's that, friends! Next week Josh returns for baseball and other stuff, and we'll play the new sweet tune from VISTA. And tomorrow, the dessert menu is all about Fall TV shows! Yeah! Until next time, don't do anything I wouldn't do!